Those vaulted ceilings are going to look great. WOW. Excuse me while I pick my jaw up off the floor…that place is unreal! The midwest really knew what was up during the early 20th century. Hot damn! Haha, the sausage king of Chicago? REALLY? That is awesome. Did Abe Froman succeed him? This is almost as awesome as that time I asked my husband to hand me my phone at 11:45pm, and he said, word for word, “Who you gonna call?” I have never answered any question more enthusiastically in my life. P.S. That bathroom is SO beautiful, even in its decrepit state. Your next car should be a truck. House is really coming along, I’m eager to see each installment of its progress. 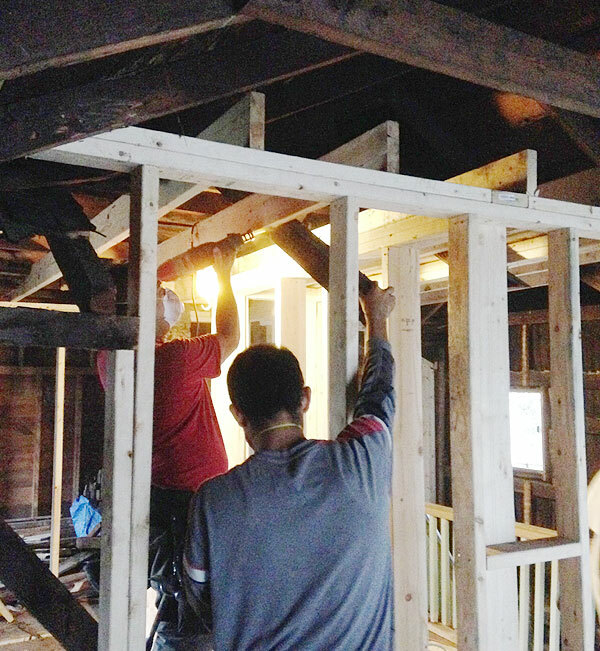 Especially once drywall goes up, fixtures go in, and it starts to look like a real house again. I know, I think I need to bite the bullet and find myself some old rusted truck just for this kind of thing. My poor friend John is so sick of letting me borrow his!! This is shaping up nicely. Maybe it was originally a small stable for a horse or two with a small and low-ceilinged hay loft above. What’s your theory? I think that’s totally possible! Definitely something I’ve thought about. I want to watch the TV show of this renovation. And at the end of this episode would be a close up of you, sitting on the the front steps after everyone has gone home telling us about how much you really appreciate having a great contractor like Edwin and at the end of the renovation, all the guys on the team stand around you and present you with your very own Sawzall or an engraved hammer or something super campy like that. Hahaha! But I already have my own Sawzall!! More or less, yeah! Stuff can stay surprisingly stable just by virtue of being attached to each other (like those “floating” rafters were also nailed to the original sheathing, which was also attached to rafters that were supported…that kind of thing), but definitely not a recipe for longevity and safety. Now it’s very solid! He really is! He works so fast and seems to genuinely enjoy what he’s doing, which is such a pleasure. I love him! So excited to continue to watch this house transform! I love all the natural light coming in from those windows! C’mon your posts are never boring ! DIY is in the details…. I appreciate that, Gaia! I usually have no sense of what people will find more or less boring, so I worry a lot! Ha! To be honest, I don’t think I’ve read a single post of yours that I thought was boring. That either makes me really nerdy, or you really good. I suspect it’s mostly the latter. Please don’t worry about being boring — just keep blogging, even if you can’t post every 2 days! That seems like a totally great price considering everything that was done. I need these magical construction elves! Yeah, I agree. Considering how quickly they got it all done, they still made out pretty well (if you broke it down hourly, you know? ), but yes—way cheaper than it could have been, for sure. Another post, so quick? Thanks! Again, applaud your efforts to stabilize/shore up the cottage. Sounds like it’s getting more love & consideration than it ever did. Glad you were able to get a bit more height in the midsection; avoiding claustrophobia but allowing for coziness. I want photos of the backyard/fence (even if it’s a blank & teeny space)…probably covered in snow @ this point. Best of luck with the heat situation. It’s back to typical weather in Buffalo; UGH! I’ll probably save pictures for the spring! It is covered in snow, there’s not a lot to see at all! The backyard is a whole other project…it’s small but needs a lot of love, too! Aaaaaaah another post so soooon!!! Hey we installed a ceiling medallion this weekend inspired by you and it looks amazing! Oh, that’s great! I’m glad to hear that! Don’t they look shockingly authentic when they’re up and caulked? Ours fool everyone. it’s so true…it looks like it’s always been there…which is the whole point when you are adding things to an older home…I love it!! I for one *love* the “boring and technical” posts. I am incredibly jealous of your renovation. I can’t wait till I move to the US (from Australia) and buy a little house of my own to play with! I’m glad to hear that, Kirsty! I always liked this stuff, too…honestly I wish I could be even more detailed and technical! Let me guess – Edwin can boogie around on that bucket like whoa? Most renovators guard the name of their contractor like their ATM pin. Either because they believe they are going to be big stars soon and will need their contractor all to themselves or because they don’t want anyone be successful except themselves. You sir, are super classy and humble. Can’t wait until you get a TV show. Aw, that’s kind of you to say! Edwin is so great, if I had more money and could give him more work, I would! I’d love to pass some business his way. I love looking at these pictures of the framing. Not boring at all. I could watch this kind of work all day long. Thanks for sharing. Oh I love the idea of a tv-show, or rather something on youtube so I could watch as well! Lumber is pretty, and men with sawdust in their hair does not hurt one bit… I am so impressed that your are not cutting corners for a house that you will sell, it is most honorable. 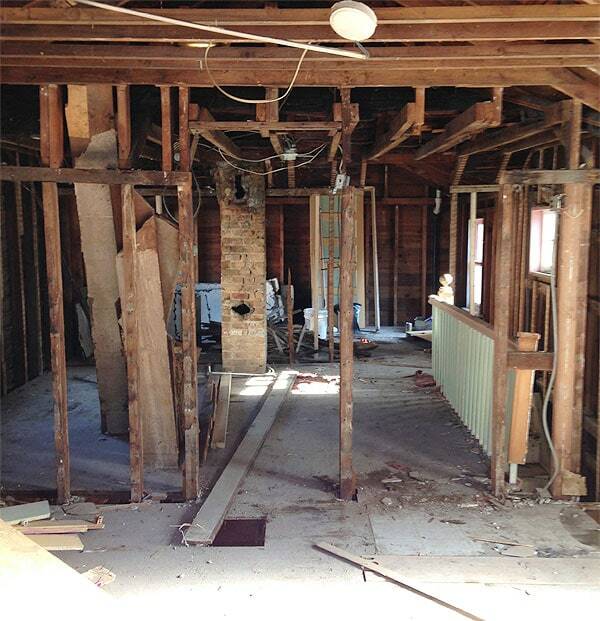 I wish I could buy a house where the reno was fully disclosed like this! I wish I could buy a house where the reno was fully disclosed like this! I agree! I hope you let your buyers know of your blog so they can watch the transformation of their “new” house, even if it’s after the fact. I think they’ll appreciate their house all the more knowing how much thought and effort you put into it for them. I hope you got a quote beforehand and are not paying by the hour. In any case, less than 6k for two men working 10 days would be a steal over here, you’d end up paying at least half more. I do remember that feeling of openness from back when we removed all framing from our attic (http://townhousehome.com/cleaning-attic/), it suddenly felt a lot bigger and brighter (and now with all the roof windows we put in, even more so). That reminds me, I still need to take some decent pics of that. I’m glad to see things are done thoroughly now, instead of an easy fix. Given that you plan to sell or rent, a lot of shady people wouldn’t do what you’re doing now, so respect! Yes! Big jobs like this I like to know exactly what I’m getting into financially. Smaller stuff I sometimes do hourly + materials. It just depends! 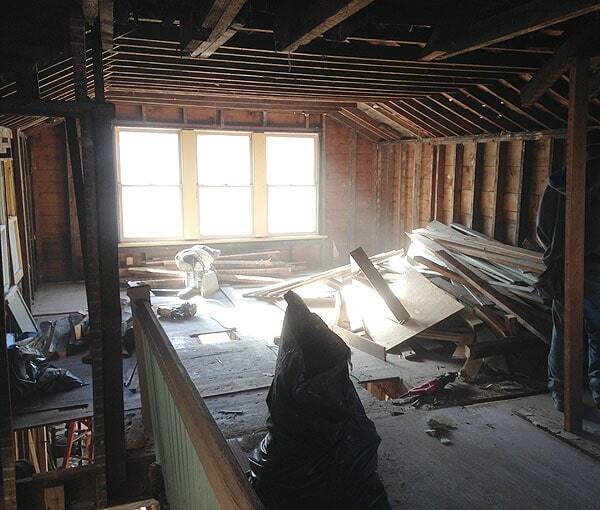 Wow, your attic space looks like so much fun! What’s your plan for it? Amazing seeing all that…kind of mind-boggling to a construction newbie. Sooo jealous of your contractors…getting quotes around $5500 just to redo front house steps…. I think flying E + E here and having them do the work might be worth it! I need those 2 in Montreal, tout suite! Ha, it could be! Isn’t it crazy how the cost of labor varies so much depending on where you are? 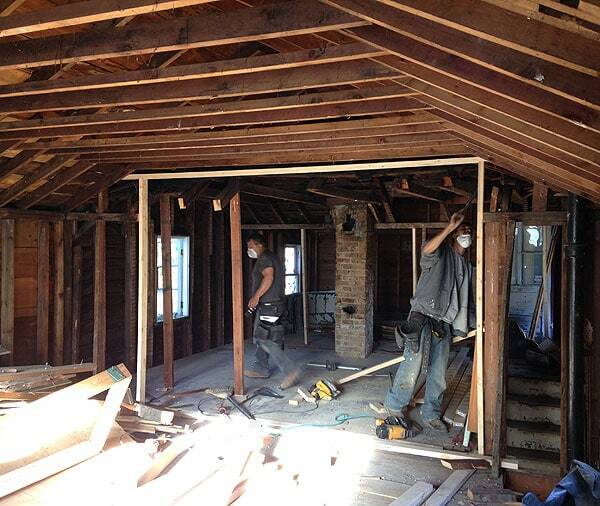 My thoughts on the two framing posts are that the house is already beautiful. Compared to the before this is already such an amazing improvement. All of a sudden you can see it all come back to life, it is a testament of your love and dedication and it truly does show. Keep up the good work, some day a family who will live here is going to be safe and warm and they will never have to worry about the roof over their head or the ground beneath their feet. And they will have you to thank for it. That is a pretty amazing thing you are doing. As a parent, knowing I’m putting a safe roof over the head of my little girl and having to not worry about it is worth its weight in gold. That’s such a nice comment, Kelly—thank you! I’m glad you can see where it’s going, too…it’s hard for me to tell if these pictures are really showing anything discernible if you haven’t been in the space! I really like posts like these. I really, really like posts like these. Shush. 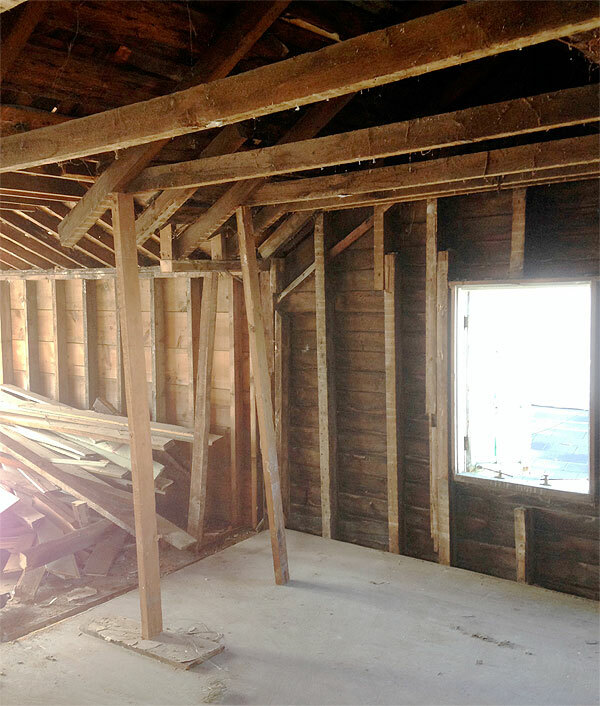 Let me enjoy your posts about LVL beams and framing!! 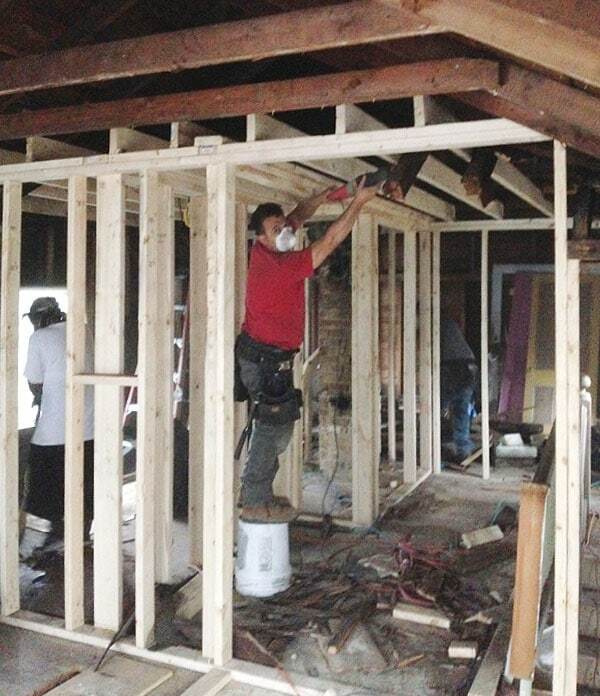 your exercising your right to work alongside such a talented contractor is very inspiring. as is the work of framing itself, and how much these guys know. real props to all of you. I teach 5th grade and have two students named Edgar and Edwin, respectively. As I read through these posts I keep picturing a couple of ten-year-olds working alongside you. It makes for entertaining reading. It’s so great to see the new spaces coming together! And the future master bedroom already looks 100% better without those tiny closets. These posts are really fascinating. I wish you could make a schematic and show us what a top plate, sole plate, collar ties, etc, etc are. Also on the first floor you fixed something that lies on top of the foundation. You are educating tons of people here. I like it. You can find out about this cottage going through old census records on Ancestry.com. They did the census by the street, so you might be able to find out if a real family lived there, or it was attached to another property. The 1890 census was destroyed, but 1870 and 1880 are intact. I think that New York state might have had their own census also. I love the way you are opening up this place. It seems very zen to me. I can’t wait to see what trim you select. Nicole Curtis might want to work on the Oscar Mayer mansion in Evanston with you. She’s done with her LeBron James house. Take care of yourself, remember you are still recovering. Love this new habit of sharing your diary! I reminds us that we should do the same and it really helps looking back at our accomplishments. Especially in renovations, when you feel overwhelmed and like nothing is getting done! It is so fantastic to follow along with your progress! I’m an architecture student and it makes me so happy to see proper framing and the like, since it’s really the bones of the structure that make the space. Though I am, of course, very excited to see the finishes too! Happiness is following a renovation project with the right vision, the right planning and design, the right contractors and workers and the right journalist. Daniel, I took a screenshot of an ad that appears in the body of your blog. How can I send it as an attachment? Nevermind… I found the contact info on the homepage and mailed you the screenshot. 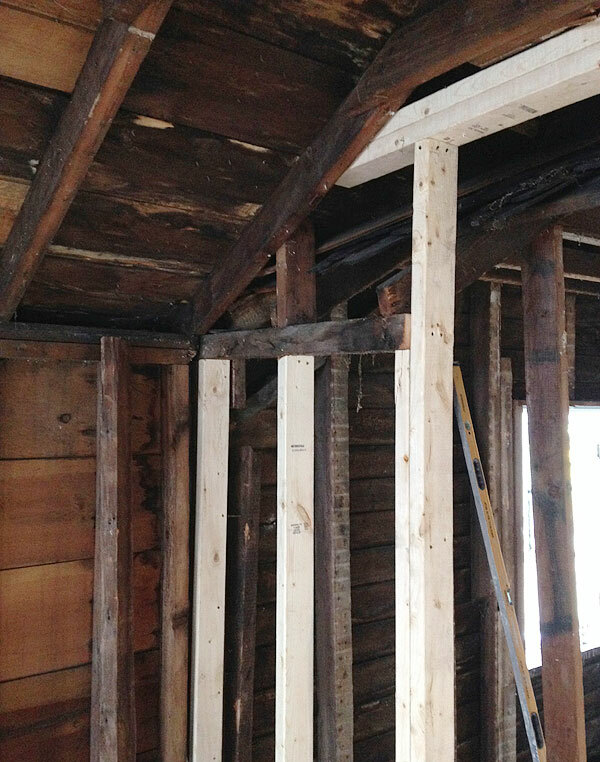 On another topic… Don’t you just love that old framing lumber? It’s usually of a quality that is only used for finish work now days. Those clear, straight, unplaned 2x4s, make our modern lumber look pretty spindly. Best of luck and fingers crossed for warmer weather! ← The Renovated Living Room!